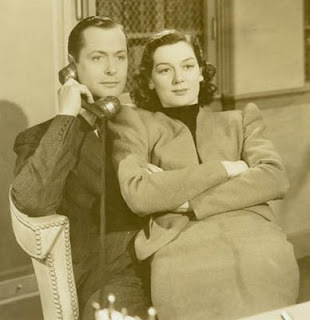 After a two-week hiatus from the series, here I am again with the 1937 drama Night Must Fall, starring Robert Montgomery and Rosalind Russell. Montgomery garnered an Oscar nomination for his performance as Danny. 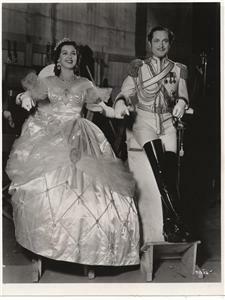 Although Miss Russell never received any award recognition for her performance as Olivia Grayne, she gave a fantastic performance as a character that is more complex than she looks. 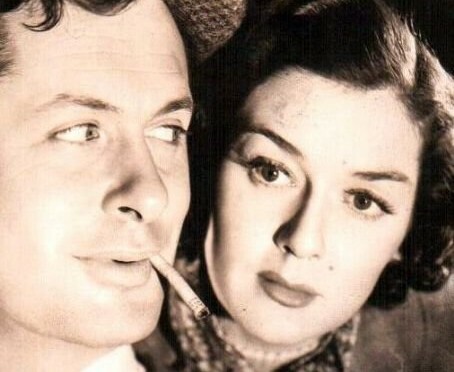 Night Must Fall is one of the highest rated Rosalind Russell films on IMDB, which is a rarity because it is not a comedy. But this goes to show everyone that Roz is capable of more than just comedy. She can do a wide range of different genres and do it well, too. This is a film that is based on a British play, so of course, every character is from the United Kingdom. Obviously, Montgomery and Russell were American, not British, but they both did well with their accents. Robert Montgomery playing the sinister psychopath Danny who has a talent for decapitation certainly steals the show, but Olivia is a repressed, sheltered young woman with many complexities beneath her icy surface. Heading the supporting cast is the great actress Dame May Whitty. This was the first film I saw her in and I have to admit that I found it hard to like her even as an actress after seeing it. 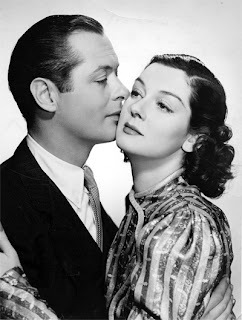 However, my feelings softened toward her as I saw her in kinder, more sympathetic roles like in The Lady Vanishes, Mrs. Miniver, and The White Cliffs of Dover. The next morning, a young woman named Dora (Merle Tottenham) is bicycling to the house where she works as a maid. Her day starts off badly as the woman she works for, Mrs. Bramson, is yelling for her because she found two broken cups and saucers buried in the rose bed. Dora is a spindly, timid little thing and breaks down in tears when Mrs. Bramson fires her. She tells her that she hasn’t been feeling like herself lately because of some problems with a young man. Dora gets to keep her job, but Mrs. Bramson insists on seeing the young man and speaking to him about it. It is during this exchange that we first see Olivia, her niece. Olivia is an unassuming young woman who wears glasses and sits on the couch, knitting. She wears sweater and skirt sets and this is all she seems to own at first. The way she carries herself, one can tell she is very repressed, frigid, and subdued. At the same time, the first impression of her aunt is that she is a very mean old lady who appears to be a hypochondriac. She complains often about her “ailments,” but complains even more often about how no one cares about them. An inspector named Belsize (Matthew Boulton) comes by the house and informs them that a flashy, blonde woman named Mrs. Chalbrook is missing. Olivia starts thinking about how she might be dead and in a creepy sort of way, she makes up a story about what may have happened to her and where she might be, saying, “I wonder on a very fine morning what it would be like for night to come, and I never can… it’s silly.” Olivia has a very wild imagination and it is obvious she needs it to pass her days in a gloomy house with a very mean old woman. Danny makes his appearance at the house and he makes quite an impression, eyeing all the women in the room, a cigarette permanently dangling from his mouth. When he first spies Olivia, she gives him a funny sideways glance, looking suspicious of him already. When Mrs. Chalbrook is mentioned because she frequented the Tallboys where he works as a pageboy, he oddly seems to remember every single little detail about her—from the size of her ankles to how her eyebrows looked. Olivia doesn’t approve of him in the slightest and walks off in a huff. 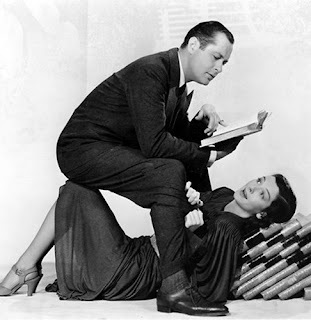 Danny says to Mrs. Bramson, “She’s a fine bit of ice for hot weather, isn’t she?” What was intended to be a scolding conversation with Danny turns into something quite the opposite when he works his charm on Mrs. Bramson. She is pleased when he actually acts interested in her made-up ailments and it isn’t long before he has her under his spell and she stupidly hires him to work for her, thinking Olivia is not a suitable woman to work for her because she always forgets to give her medicine. Olivia is treated very badly by her aunt and has no private fortune, so she cannot leave the house. As he leaves the house to take her for a walk, Olivia sees him leaving. She gives him a very knowing glare. The next morning, Danny buys a shawl for Mrs. Bramson, telling her it had once belonged to his mother, further charming her into his trap. Olivia notices the price tag on the shawl and for some inexplicable reason, slyly takes the tag off without her knowing. 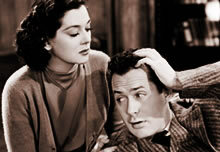 There is a young man named Justin (Alan Marshal) who is Mrs. Bramson’s lawyer and takes care of her finances. He also loves Olivia and wants desperately to take her away from this miserable life she is leading. However, she refuses to go with him because she doesn’t love him. 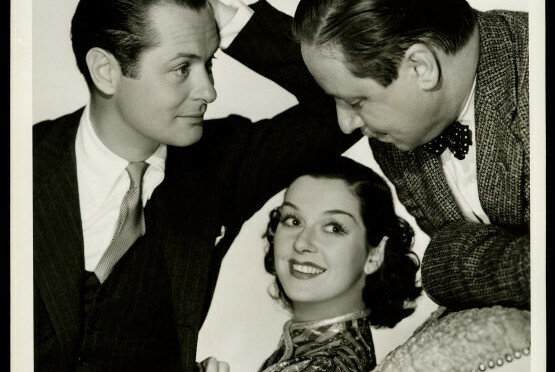 It is obvious she does not approve of Danny when she says, “I think he is common and insolent and conceited and completely double faced.” At the same time, she is strangely attracted to him. When she notices his cap hanging in the hall, she takes the opportunity to go to his room and talk to him. She seems to be under the impression (although she would never admit it) that now that Danny has entered her life, more excitement will come her way. However, when he starts to make her feel uncomfortable, she quickly walks over the window, wanting to open it. He beats her to it and with his arm above her and his face and body just an inch away from her, she gulps and becomes frightened, walking away as fast as she can. She tells him she doesn’t care what she looks like after he advises her that she might be better looking without her glasses. As the days pass, it is clear that between Olivia and Danny, Mrs. Bramson prefers his company, even though she hardly knows him. The difference in her tone when she speaks to Olivia or to Danny is remarkable. She is sweet and kind to Danny and mean and harsh to Olivia. Meanwhile, Olivia has actually taken Danny’s words to heart and takes off her glasses, squints at her reflection in the mirror, and there is a flicker of a smile as she shakes her hair out and continues to look at herself in the mirror. From then on, she doesn’t wear her glasses, so it is apparent that she cares what she looks like. More cruelty is directed at Olivia in a scene where Mrs. Bramson is trying to play a card game. Olivia is smoking a cigarette and helps her by showing her what to do. She harshly yells at her, “I saw that!” and coughs at her cigarette smoke. But when Danny smokes right near her face and tells her the same thing, Mrs. Bramson smiles and thanks him for helping, telling him his cigarette doesn’t bother her at all. 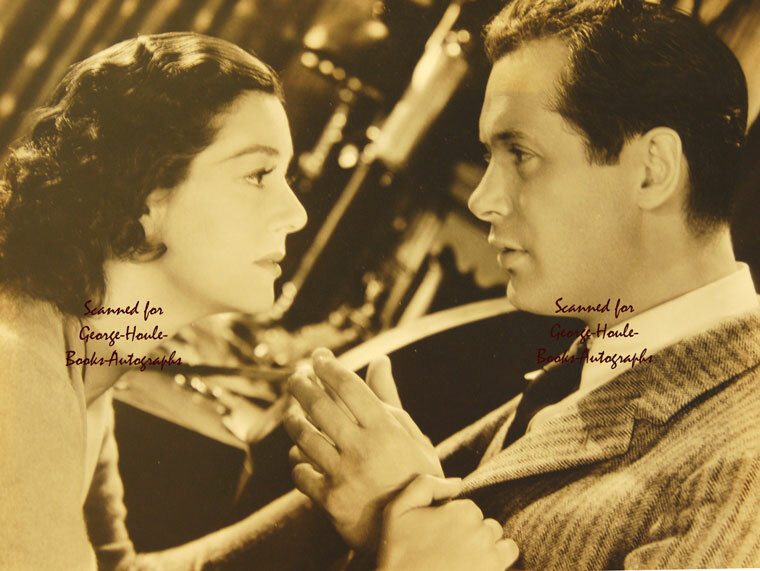 One day, Danny is fixing Mrs. Bramson’s wheelchair while whistling “Mighty Lak’ a Rose.” Olivia suddenly remembers that the mysterious figure in the wood on the night that Mrs. Chalbrook went missing was whistling this tune. Things get to a dangerous point when Danny decides to take a few drops of whiskey and Olivia immediately senses it. She takes the opportunity to question him about the murder of Mrs. Chalbrook. She is very close to getting a confession from him, but he catches himself before he goes too far. He is a young man who thinks very highly of himself and likes to “act” all the time. When Inspector Belsize comes back to inspect Danny’s things because he saw Mrs. Chalbrook the night she went missing, Danny starts to freak out. He thinks he’s very close to being found out and doesn’t know what to do. Olivia has suspected something of Danny’s hatbox ever since she first saw it, and when Inspector Belsize says he wants the key to open it, she covers for Danny and tells him it is her hatbox. Even Olivia doesn’t know why she covers for an obviously dangerous man, but she can’t seem to help herself. It is now the final final straw for Olivia and she intends to go running back to Justin again, but before she leaves, she warns her aunt of the company she is keeping in the house. Mrs. Bramson thinks she is insane and lets her go. Unfortunately, it is obvious who the insane one is when Mrs. Bramson almost scares herself to death after being left alone in the house. The way she hysterically screams and laughs simultaneously after Danny comes back is a bit frightening. 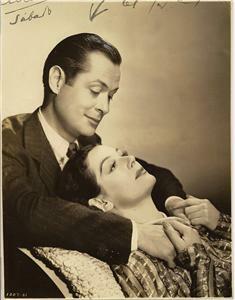 But everything ends for her there when as she tells Danny what a nice, sweet man he is, he smothers her with a pillow. Once again, Olivia comes back. She discovers that Danny has killed her aunt and will probably cause her harm as well. He walks toward her and she stares back at him, never so scared in her life. Fortunately, the police burst into the house with Justin, who protects Olivia. This is the part that always awes me as we watch Danny go through a gamut of emotions as he realizes that his perfect murder has gone awry. He doesn’t understand why they are there. He thought he was so smart, so clever, so precise. He has a few moments of hysterical insanity as he is finally put into handcuffs and taken away. And although there were unhappy endings for most, there is a happy ending at least for Olivia, the poor young woman constantly belittled by her aunt. There is an escape for her. Sorry if I’ve been neglecting the blog lately…. 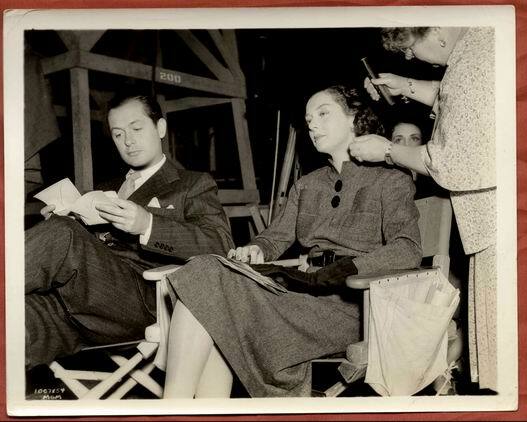 been busy with classes… here are some photos of Roz with her four-time costar Robert Montgomery!